Here follows a tour of Delos most important archaeological site, certainly the most important in the Cyclades. This tiny island, blessed wih the most translucent atmosphere in the Meditarranean, to the extent of having been chosen by Apollo, the god of light, for his birthplace, has been for millenia the religious center of Greece. The tour of the site, taking in remains of various periods from the 2nd millennium BC to Roman times, begins on the west side of the island, in the area of the ancient harbor, where visitors land at a mole built up of excavation debris. From here the road leads to a large paved square, with marble pedestals and altars, the Agora of the Competaliasts (named after merchants protected by the Roman gods of Crossroads- Lares Compitales). This used to be a center of slave trade as well, according to Strabo. From the Agora of the Competaliasts a broad paved way runs to the entrance to the Sacred Precinct. It is flanked by two stoas, the Stoa of Philip V of Macedon and the South Stoa, behind which are the remains of the South Agora. Climbing the three marble steps of Propylon, we enter Hieron of Apollo, which extends northward to the Stoa of Antigonos and eastward to the Hellenistic wall beyond the Ship Hall. Immediately adjoining the Propylon, to the right, is the House of the Naxians, on the north side of which is the base of a marble statue of Apollo erected by the Naxians about 600 BC. Part of the trunk and the thighs of this colossal figure, which originally stood some 9 m (30 ft) high, can be seen to the Northwest of the precinct, which was bounded on the south and west by a stoa. Here the excavations found a large building, almost square in plain, identified as the Keraton in which the old horned altar of Apollo once stood. Immediately adjoining to the north is the badly ruined Precinct of Artemis, built in the 2nd century BC on the site of an older 7th century building. In the center of the Sacred Precinct are three temples of Apollo, of which only the substructures remain. The oldest and smallest, the most northerly of the three, dates from the first half of the 6th century BC. It was built of porous limestone and housed an 8m (27 ft) high bronze statue of Apollo cast by Teuktaios and Angelion of Aegina. The bronze Kouros in the Pireus Museum has recently been associated with this temple. The second temple, the most southerly, was the largest of the three and the only one to be surrounded by columns. It was begun in the 5th century BC but was apparently not completed until the 3rd. Between those two temples is the third and latest of the three, the Temple of the Athenians, the most elaborately built of all three temples. North of the three temples, set in a semicircle, are the five Treasuries, from which we continue to the so-called Prytaneion and further east to a long building known as the Hall of Bulls after its bull's-head capitals or as the Ship Hall (Neorion) after a ship which was set up here in thanksgiving for a Macedonian naval victory. On the east side of the Hieron of Apollo is the Sanctuary of Dionysos, in which are several marble phalluses. On one of the bases are carvings of scenes from the cult of Dionysos. West from here, the greater part of the north side of the “Hieron” is closed by the Stoa of Antigonos, 20 meters (60 feet) wide and 120 meters (360 feet) long. Besides triglyphs and metopes used in Doric friezes, additional ornamental relief bull’s heads were also used. It was built by king Antigonos Gonatas of Macedon about 250 BC. At the west end of the Stoa of Antigonos we leave the Hieron of Apollo, continue past the Agora of Theophrastos and a hypostyle hall on the left, and then pass the Temple of the Twelve Gods to reach the temple of Leto. This was built about 500 BC and preserves some courses of marble, with a bench running round the exterior, on gneiss and granite foundations. To the right, east of the temple, is the Agora of the Italians, the largest of a number of similar structures built to house foreign merchants. From here, passing between the Temple of Leto and a long granite building, we follow the processional way, flanked by a number of lions in Naxian marble dating from the 7th century BC - the earliest monumental figures of animals in Greek art. They look out over the Sacred Lake, which was filled in 1925-26 on account of the danger of malaria. In the lake there is a palm tree, recalling the palm under which Leto gave birth to Apollo and Artemis. Other remains in the northern part of the site are the Establishment of the Poseidoniasts of Berytos (built for the accommodation of merchants from Beirut), the Granite Palaistra and the Lake Palaistra. The Museum contains a fine collection of material from the site, although some of the best items found here, such as the relief of Nikandros, are now in the National Archaeological Museum in Athens. Adjoining the museum is a snack bar where we can buy some refreshments. From here we can look around the area to the Northeast, in which are the Gymnasium, the Stadium and a residential quarter near the sea, with a synagogue. From the museum the visitor can walk to mount Kynthos. First you see the Terrace of the Syrian and Egyptian Gods (2nd century BC), with the Sanctuary of Hadad and Atargatis, which includes a small theater, and the Sanctuary of Serapis and Isis. Here too is a Temple of Hera (5th century BC), oriented to the south, from which a flight of steps climbs the slopes of mount Kinthos. On the top of the hill are remains of a 3rd century temple dedicated to Zeus Kinthios and Athena Kinthia, who were worshipped here from the 7th century BC. 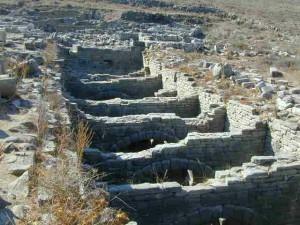 The ancient city of Delos has a typical example of a house of the Hellenistic period. Is the one known as the House of the Dolphins. The entrance leads into the peristyle, with the mosaic pavement which gives the house its name, and adjoining this are a large room and several smaller apartments. Opposite it is the larger House of the Masks, the peristyle of which has been re-erected. The badly ruined theater, with seating for some 5000 spectators, dates from 3rd century BC. Behind the stage is a large cistern with nine chambers in which rain-water flowing down from the auditorium was collected (photo). There are a number of other notable buildings on the "Theater Road" which brings us back to the harbor, including the House of the Trident and the House of Dionysos, both named after their mosaics, and the House of Cleopatra, named after the statues of Cleopatra and her husband Dioskourides which were found here.